These notes give some grounding to my text Writing with Fungi, Contagious by situating it within my broader, ongoing process of thinking with the artistic practices of Terike Haapoja and Essi Kausalainen, while tracing out further resonant threads between their works. Moreover, the following situates my writing within the lived embodied experience that is not only inseparable from but actively feeds into this production of thought. This is what urges my writing on. Essi Kausalainen. Lovers. 2017. Beyond Telepathy. Somerset House Studios. Photography by Tim Bowditch. I open the door to the small overgrown back garden and take a deep breath. The air feels fresh, despite the warnings of unprecedented pollution levels in the city today. It must linger here in this tiny refuge too - invisible, insensible. Getting chilled I reluctantly return indoors, turn the dehumidifier on, hoover the carpet once again. Hanging yet another spider plant on the wall, I remind myself to check the list of air-cleaning plants - provided online by NASA. Futile battle perhaps. I will never master the art of air purification amidst this dense cocktail emanating from the traffic, the spongy Victorian brick walls, the everyday chemicals from the past and the present. I open all the windows wide again. The boundary between indoors and outdoors collapses even while a difference persists - like in every breath, inside out, outside in. My writing takes place on this very threshold. Luce Irigaray has written on the forgetting of air in European culture and philosophy - the essential element that provides us with an invisible dwelling everywhere and a medium necessary for the reception and passing on of all sensory messages, including these words of mine: ‘Breathing is an organiser for living itself and for the coexistence between living beings’ (2016: 28-31). As my breathing becomes more and more troubled - indoors and outdoors - am I incapable of living these co-dependencies? Or, am I suffocated by the increasingly impossible place allocated to me in a culture that has forgotten air in its insistence on hierarchical dichotomies, impermeable boundaries, and aggressive extraction of value from all that is deemed other to the Anthropos - my female, middle-aged embodied being included? For certain, I am short of breath due to the intensifying violent onslaught of the rise of fascism and ecological urgency, both so deeply felt today. The boundaries of my self are porous, traversed by myriad flows and forces - contagions ranging from bacterial to emotional. No taxonomies or measurements could explain all the trouble away as either subjective psychosis or physiognomic deficiency. I am out of order, part and parcel of a disorderly world. Terike Haapoja. Closed Circuit – Open Duration. Venice Biennale 2013. Nordic Pavilion. Dialogue detail. Photography by Ugo Carmeni. 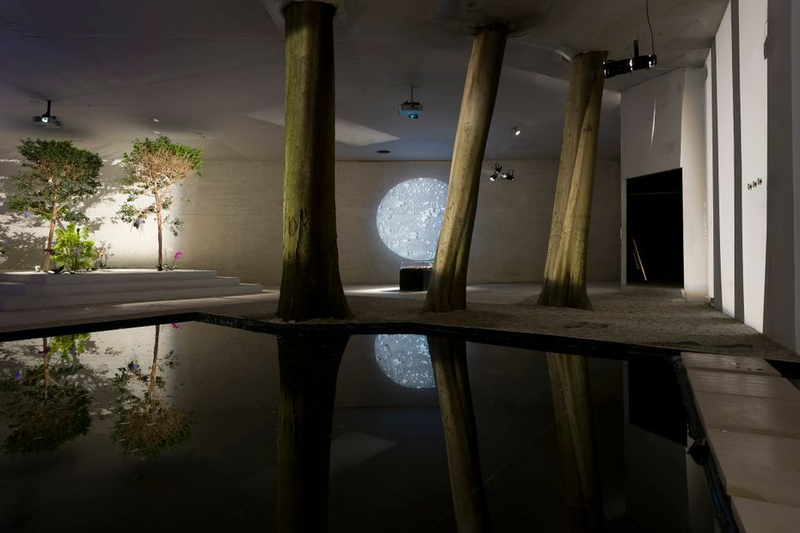 A retreat is needed now to a moonlit garden where trees spoke back and the soil breathed, in the Nordic Pavilion at the Venice Biennale 2013. This was a garden dramatically unlike the surrounding miniature world order staged both in the constellation of national pavilions and in the European garden tradition of the Giardini di Biennale. A series of works by Terike Haapoja under the title Closed Circuit - Open Duration suggested another approach to what has been deemed disorder, the ceaseless move towards diversification and transformation - it cannot be contained yet it may be listened to and breathed with. Here my breath called for the trees to respond and they breathed back through photosynthesis, translated into a whistling sound. Yet their breath is radically different to ours and cannot be reduced to a mirror even though it does reverse the human process of oxygen consumption. What is at stake here is a much more complex entanglement, where interiority is enmeshed with the exterior. The breath is just one of the numerous life sustaining border crossings. It does not imply dissolution of the embodied subject, yet suggests that interiority and singularity are founded on plurality and entwinements of all sorts. Furthermore, other beings and things may well have interiorities of their own too, as Haapoja argues (Elfving & Haapoja 2016). In this scenario I am more than one and have no longer exclusive ownership of mental agency or the privilege to externalise all unbounded materiality to the bodies of others. The abundant alien life that is part of the artist’s face bears witness to this, in a microscopic image blown up to a planetary scale that looms like a moon above the garden. The expulsion of all these tiny others would not reinstate the unity of the subject but most probably destroyed its face - and beyond - thus undoing the very foundations of its identity. Under this moonlight, I stepped cautiously onto flagstones to cross a pool of water. There were ripples, not on the immediate surface of the water but elsewhere, projected back to the space as a spectral image. Haapoja's garden makes tangible how our coexistence can manifest in audible and visible reciprocity but may also have unexpected, temporally and spatially removed affects. The technologies of mediation are laid bare here, yet as such they allow the viewer intimacy with rather than access to the trees and other co-inhabitants in the space. This intimacy - unlike immersion - demands the acknowledgement of irreducible differences and, consequently, responses that may come in unpredictable and untranslatable forms. I take a deep breath and am viscerally entangled in the indeterminacy of communication and contagion that we - I, the trees, the soil, the other viewers - never really pre-exist. Terike Haapoja. Closed Circuit – Open Duration. Venice Biennale 2013. Nordic Pavilion. Installation view. Photography by Ugo Carmeni. 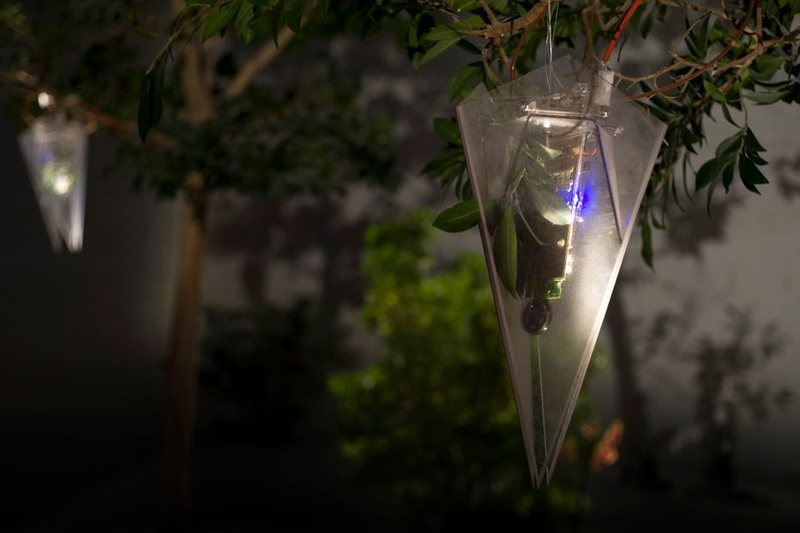 The air becomes thick - with projection and anticipation, messages inseparable from the means - around Haapoja's trees as in a recent performance by Essi Kausalainen. Lovers (2017) continues Kausalainen's work inspired by mychorriza, the symbiotic relationship between plants and fungi. 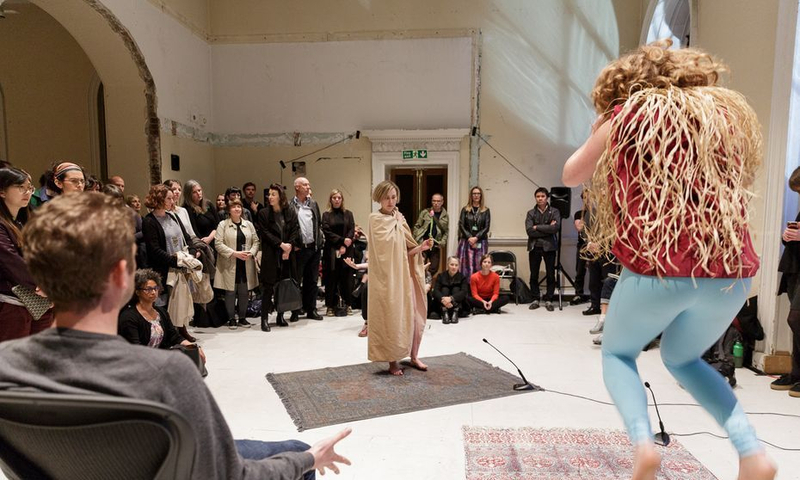 In the performance the bodies of two performers never physically meet yet their distinct movements resonate with one another, not unlike the voices of the two singers framing this event of coming together. Like in the case of plants and fungi, symbiotic co-becoming does not imply fusion as opposed to detachment. Nor does it happen merely in embodied entanglements but also across complex spatial and even temporal distances. The air between is charged as a space of encounter, no longer a void to be bridged but a medium necessary in co-dependence. Kausalainen's performance does not so much attempt to capture - whether through embodied or narrative representation - the mychorriza as an alternative model of coexistence applicable to human relations. Rather, her series of performances appear as experiments with different practices and processes of co-dependence and communication. Empathic identification is not an option here, yet imaginary leaps and play with diverse means of mediation at hand - words, harmonies, tulips, office chairs - may allow for contagious openings of thought as well as sensibilities beyond sense making. Transformative potentially to all the parties involved, compassion can thus become contagion that ruptures the aggressively guarded illusion of self-containment - not unlike the shared breath. Trouble surely lies in all contagions, with numerous dangers, yet also joy that comes with the capacity to breathe, to think, to write. After all, ‘single vision produces worse illusions than double visions or many-headed monsters’, as Haraway has argued (1991: 295). A deep breath - in and out - no longer allows me simply to become centred. Rather I begin to pay closer attention to the plants that I attempt to breathe better with. They can never fully exorcise the trouble. The research on the air cleaning qualities of houseplants has entwined with the instrumentalisation of plants in the construction of inhabitable new colonies. How else could we approach these generous green cohabitants of ours? My much loved albeit awkward monstera plant comes to mind, as I have yet to find information on its purifying properties. What is so monstrous about it? ‘The promise of monsters is a regenerative politics, an invitation to explore new ways of being in touch, new forms of becoming, new possibilities for kinship, alliance, and change’, Karen Barad writes (2015, 410). Rather than aiming at cleaning and restoring some lost state of purity, or an imagined original balance and order, this is a call to weave novel relations. It is a matter of care and responsibility - responsiveness and respect - also for that which troubles. The entanglement of our fates and the attentiveness this demands, is way more complex than any service or barter economy. My codependence with the monstera is simply not scalable to any, however sophisticated, carbon exchange. For collaborative survival at the time of mass extinctions, we need to protect the existing and build new refuges for diversity, Anna Tsing argues. Contamination is what makes diversity, she writes about mychorriza (2015: 29). These refuges cannot therefore be escapes, enclosures, exceptions, elsewhere. The breathlessness, lived by so many today, is not merely a matter of air purity and climate control - quite the contrary, perhaps. Sealed units cannot breathe. My writing has to then also become a breathing practice. Barad, Karen. 2015. ‘Trans*/Matter/Realities and Queer Political Imaginings’, in GLQ: A Journal of Lesbian and Gay Studies. Vol. 21. No. 2-3, pp. 387-422. Elfving, Taru & Haapoja, Terike. 2016. Altern Ecologies. Emergent Perspectives on the Ecological Threshold at the 55th Venice Biennale. Helsinki: Frame Contemporary Art Finland. Haraway, Donna. 1991. Simians, Cyborgs and Women: The Reinvention of Nature. London: Free Association. Irigaray, Luce. 2016. Through Vegetal Being. New York: Columbia University Press. Tsing, Anna. 2015. The Mushroom at the End of the World: On the Possibility of Life in Capitalist Ruins. Princeton: Princeton University Press.